So far I have discussed three of the five centers Ms. Maxine Cornwell of my Learning Centers course suggests all centers have. There is the block center, art center, and family center; now on to the next: the cooking center. I must confess our school does not have a cooking center. I like to do things that involve food with the children, but usually we don't cook anything. Our school used to have the most wonderful kitchen where we would make muffins, cookies, pizzas, and items for our Thanksgiving feast. The church then underwent a huge renovation and put in this huge state of the art kitchen for which you have to be certified to use. The stove and oven are like this huge apparatus that almost attacks you as you come in the kitchen(of course I am exaggerating), but it is definitely not user friendly. We have a small microwave in the room, but nothing else. I guess I better get cracking on ways to improve with incorporating this center. Why a cooking center? At the beginning of the course Ms. Maxwell stated that all characteristics of young children must be kept in mind when helping children learn. One of those characteristics is: "Young children have very little experience, but much desire to learn." 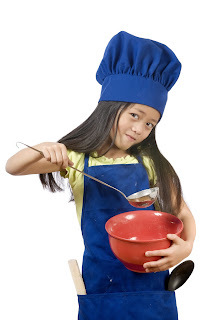 The cooking center helps to give children real life experiences that help them learn. Ms. Maxwell states that a cooking center needs to be a place with very good equipment so that the children can use them with confidence. "The mixing and serving bowls should be sized so that children are neither overwhelmed by huge utensils nor dismayed when the mix is too much for the bowl." It is best to have metal measuring cups and spoons as they will last longer and not melt in the dishwasher. Small muffin pans, serving dishes, utensils, and if possible, all this should be stored very close to the center so that the children are able to retrieve what is needed for projects. How does one manage a center like this? Ms. Cornwell says that when she uses this center it is best to have one or two parent volunteers in the room. The children should work in small groups with the teacher. Every child must be given the opportunity to do something. All the supplies are on trays near the table so there is no need to run around looking for something. 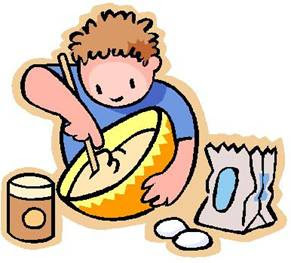 Children do as much of the work as possible; pouring , measuring, stirring, breaking eggs, spreading, cutting, mashing, pressing, etc. Many of her activities involve the use of an electric griddle(I can do that). The cooking center is the most multisensory center. The children are seeing, smelling, tasting, touching, and hearing. The more senses involved, the more learning that takes place. This is also a center that is huge for vocabulary. New words are introduced with many cooking terms. The children are involved with each other and lots of talking is taking place. Cooking activities are priceless. Good luck with this--wish me luck too. Will this be a center I use every month? Not sure, but I will try to incorporate this more. UPDATE: Hi everyone. I have a couple of comments with people asking is this a "real cooking center?" The answer is yes. The do real cooking, make real recipes, and eat the food at the end. I also thought that it might be a center used once about once a month--not really "out" all the time, but an area readily available when the cooking time came about. For Ms. Cornwell, the teacher is the leader, working with a few children at a time. The pretend kitchen area is incorporated in the family center. The cooking center is for just that: cooking with real food and creating something to eat to culminate the activity. Cooking centre at our house changes so often. I find missing packets and boxes of food all the time. We love pretend play. We just started a pretend play meme to celebrate pretend play. So is there an actual designated area in the classroom that they use every day? Or just a kitchen area to go to once in a while? When I first read this, I thought this was a center that she did everyday. Then, when I was writing the post, it seemed that it was a center she used often, but made sure to include as a center. It also sounded like it was an area in the room. She used an electric griddle, a small oven--not sure exactly what that means, and a hot plate. That's interesting. I always though this center would be fake not REAL. hmmm did she say anything about that? What do you think? yea, I was confused too. I assumed it would be a pretend kitchen area. I have that and then i do a lot of 'real' cooking with my kids. I think you'd be asking for a holy mess if you have real ingredients out often for 'play'. Are they following recipes, or just messing around? This sounds really interesting, and I'm sure the kids would love it. What's not to like about cooking real food (and eating it too) Yum!